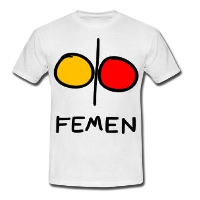 Womens rights activists FEMEN have struck again. The female protesters stripped off for Tunisian Prime Minister Ali Laarayedh as he arrived for talks with the European Commission in Brussels on Tuesday. They are angry that three fellow members have been jailed in Tunisia for staging a similar protest. Jose Manuel Barroso, the head of the European Commission, urged Tunisia to change its laws and show greater tolerance towards freedom of expression. “The EU calls for a reform of laws inherited from the previous regime, particularly in the criminal code to ensure freedom of speech for Tunisian men and women,” he told reporters. FEMEN started protesting in Tunisia earlier in June after an 18-year-old woman was jailed the previous month for painting a slogan in support of the feminist group.